The patch of Rose Kennedy Fitzgerald Greenway next to the wharf promenade and the spectacular Christopher Columbus Park looks barren now. But by fall, officials say, trees will surround a labyrinth of granite pathways, winding inward to a jet of water. From atop a 16-foot reflecting pool, a 12-sided, shape-shifting sculpture will stand as an homage to the immigrant experience in America and the 1915-era Armenian genocide that took about 1.5 million lives. After years of planning and controversy, construction is finally set to begin this summer on Armenian Heritage Park. For Armenian immigrants like architect Donald J. Tellalian, who worked for six years before presenting the final design to North End residents this week, it is a moment charged with emotion. “For those of us who came to this country and are fortunate to have made new lives, it will be an opportunity for my grandchildren and great-grandchildren to come and visit and understand that it has meaning,’’ he said, tears welling up. The park is a gift to the city from the Armenian Heritage Foundation, formed about six years ago to develop a parcel along the milelong Greenway into a symbol of gratitude to a country that gave their forebears refuge. “What this symbolizes is that we all came here for a reason,’’ said James Kalustian, president of the foundation, which raised more than $5 million for the park. Each element in the park is meant to depict parts of the immigrant experience. 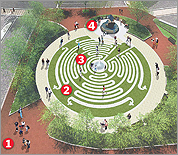 The fountain represents hope and faith; the labyrinth, the immigrant’s journey. The geometric sculpture will be reconfigured into new shapes each year to reflect the reshaped lives of those uprooted from their homeland to start again in a new one. The foundation has endowments to finance the maintenance of the park and the annual reconfiguration of the sculpture, as well as multicultural programming and a series of lectures on human rights. The park will be the second parcel along the Greenway to be developed this year. Earlier this month, city officials broke ground on the Greenway’s first building, a 4,500-square-foot pavilion that will serve as a gateway to the Boston Harbor Island National Park. Work is expected to be completed next spring, said Kairos Shen, chief city planner for the Boston Redevelopment Authority. Shen hailed the foundation for sticking to the park project and working with city, state, and community officials to modify initial concepts for it. The foundation had wanted a park of remembrance to honor the struggle of Armenians. But early in the process, the idea drew criticism from the Greenway Conservancy and city officials, including the mayor, who wanted the Greenway free of memorials, to avoid becoming a collection of monuments like those on the National Mall. “The concept is much broader now,’’ said Shen. “It’s open space that celebrates all immigrants,’’ among them the Armenians and their plight. Nancy Brennan, executive director of the Greenway Conservancy, said differences about concepts for the public parkland were quickly ironed out and now there is wide support for the park. In the North End, residents are also pleased that another bland strip of land will soon become an attractive space for residents to grab sandwiches or reflect on the past. “We waited a long time for this,’’ said Pasqua Scibelli, a former vice president of the North End Waterfront Council. A wave of pride is sweeping the Armenian community as it gears up for groundbreaking of the park this summer, said state Representative Peter J. Koutoujian.